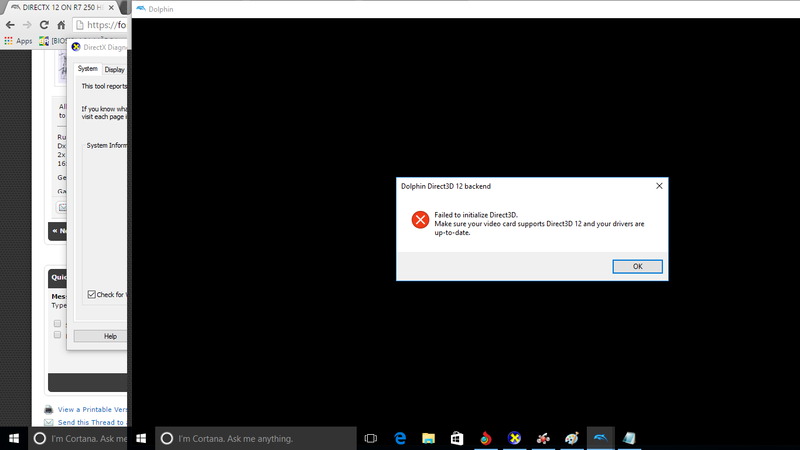 I have a R7 250 1gb gddr5 and i can run games with a good framerate using directx 11 but i want to use directx 12 and every time I try to use it my dolphin crashes, is this becouse of my directx version support or what? I don't think your GPU supports it. All R7 GCN Cards (1.0-up) are DX12 Compatible. Nv and below cards are no compatible, Except for some Nvidia cards, wich get a tiby bit of compatibility with almost no gain at all. 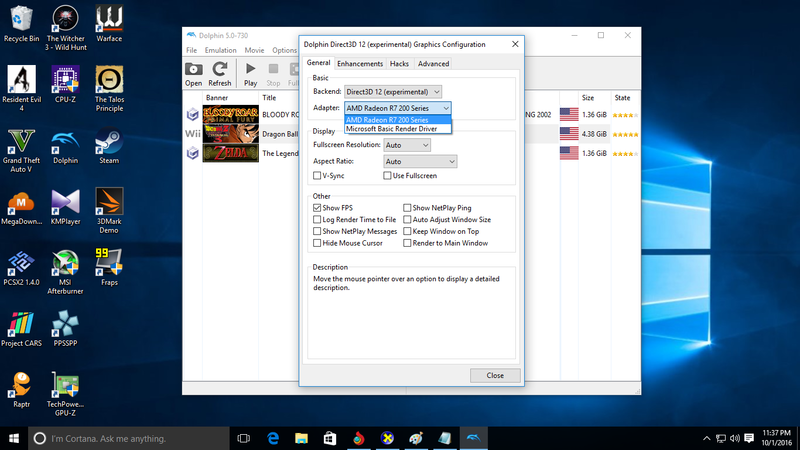 Try running dxdiag to see wich dx version you are running. Also make sure all your drivers are updated. AMD Radeon's newest driver is 17.9.2 non WHQL. Make sure you video card suppors Direct3D 12 and yout drivers are up-to-date.`` and this other messege, but when i try to use my radeon it just crashes. 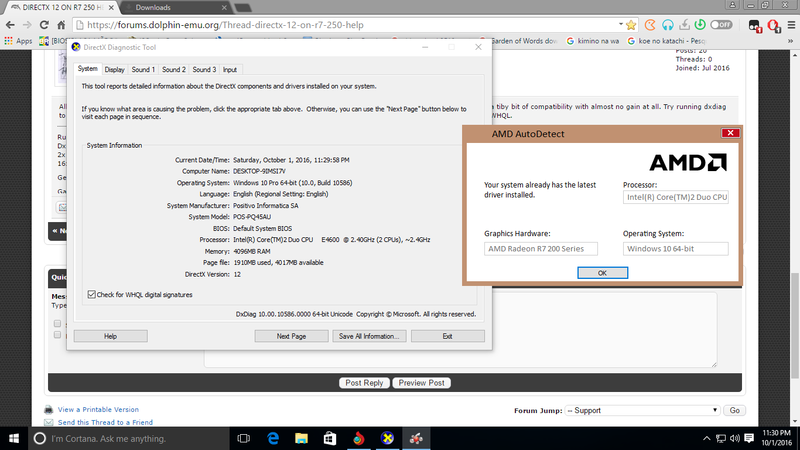 I apologize for being insistent, AMD is notorious for Buggy software. AMD's autodetect app is not reliable, not even crimson settings app is reliable. Check this link and make sure you have either one of those 2 versions. Also in my previous post I said driver version17.9.2, and it's actually 16.9.2, my bad. Crashed again :C I think my gpu just doesn`t support it. hmmm...that's really weird. Your card does support dx12 and you are already on it (as DXdiag says you are). Well, you can try a clean install of the latest build and see if that fixes anything. Also you can try the stable version, and see if that one also crashes in dx12. And lastly, you can try the recent released vulkan backend and see if that works for you (buid 748 and up I believe). Sorry I couldn't be of more help. Just because dx12 is installed doesn't mean it is fully supported, as seen in gpu-z it only shows support for 11_1 (I'm not sure the minimum requirement for dolphin).